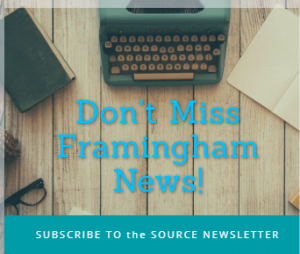 FRAMINGHAM – –SCIEX, a life science analytical technologies company based in Framingham announced that Children’s Medical Research Institute (CMRI) has opened ProCan™, the Australian Cancer Research Foundation International Centre for the Proteome of Human Cancer. The Centre has been set up through an alliance with SCIEX and will enable large-scale proteome studies that will advance cancer research and ultimately aid in the promise of precision medicine. The opening of the Centre was marked by the ProCan Industrialised Proteomics Centre Symposium, a 2-day event this month. Highlights from the event, including scientific presentations and workshop videos,which can be accessed in the SCIEX online symposium portal. The ProCan project, which was established with a $10 million grant from the Australian Cancer Research Foundation and developed through partnership with SCIEX, will help to industrialize the process of analyzing tissue samples and identifying cancer biomarkers. This is being achieved at the centre on a suite of SCIEX TripleTOF® systems using a tissue-based method developed at Ruedi Aebersold’s lab at the ETH, Zurich, a method recently published in Nature Medicine. SCIEX SWATH®Acquisition technologies provide ProCan with exceptionally high sample throughput and will reduce the significant variability that is often associated with sample preparation. Furthermore, comprehensive data is produced with the speed, sensitivity, quality, and reliability that are urgently needed in precision medicine. The large-scale proteome studies being carried out at the centre will profile thousands of tumour samples per year, to identify and develop markers of disease risk, diagnosis, response to therapy, and prognosis on an industrial scale, while developing standard operating procedures for other facilities around the globe. The Centre is equipped with a large suite of SCIEX TripleTOF 6600 mass spectrometers and NanoLC™ 400 LC systems, to create one of the world’s largest scale implementations of the SCIEX next-generation proteomics solution, featuring SWATH Acquisition and OneOmics cloud computing. Additionally, ProCan will also benefit from SCIEX’s exclusive collaborators, including Pressure Biosciences (PBIO) and Beckman Coulter, using pressure cycling technology and liquid handling workstations for increased sample preparation, throughput, and reproducibility. The Centre was officially opened in late 2016, with a ceremony during the ProCan Industrialised Proteomics Centre Symposium. At the conference, leading scientists on all components of the industrialised proteomics pipeline shared their insights, including Tiannan Gou (ETH, Zurich) and Phil Robinson (CMRI, ProCan). Children’s Medical Research Institute (CMRI) conducts fundamental research to understand the genes involved in human health and development and the underlying causes of disease. The Center conducts international research in the areas of embryonic development and birth defects, cancer, neurobiology, and gene therapy. SCIEX and the Children’s Medical Research Institute Announce Opening of ProCan to Advance Precision Medicine. 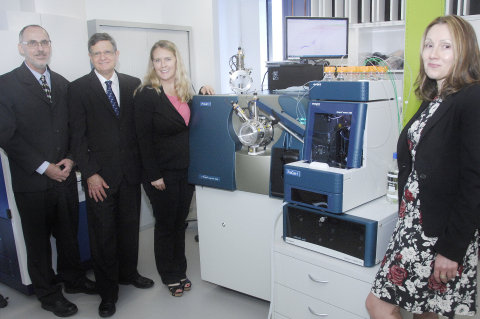 (from left): Prof. Phil Robinson (Head of Cell Signaling Unit and co-developer of ProCan), Prof. Roger Reddel (Director of CMRI and Head of Cancer research Unit), Dr. Christie Hunter (SCIEX Director of OMICs Applications), and Valentina Valova (Manager of Biomedical Proteomics Facility and ProCan, CMRI).